Don't wish for what you want. Don't wait for what you want. and watch it come to you like MAGIC! "... absolutely changed my life in just moments." It's time to make your mind give up its secrets. Not because you'll never be able to discover that information. But because you already have it! A way — a shockingly simple six-step process — that enables you to actually COMMAND your mind to instantly reveal to you the specific knowledge, information, and answers you're looking for. A real estate pro named Donna Townley used this process to COMMAND four new clients and the successful closings to go along with them, in order to revive her failing business. Within days, four lucrative clients showed up out of the blue. Donna's mother used it to COMMAND relief from the chronic pain and swelling of a decades-old ankle injury on a Saturday night. She awoke Sunday to find the pain and swelling had completely disappeared overnight and that she felt better than she had in 35 years. An executive search firm in the United Kingdom used it to COMMAND a record year. In the months that followed, their consultants' incomes shot up by as much as 200%, and the company brought in more new business than it solicited. What is this ONE COMMAND? I'll tell you in a moment. What makes the theta brain so interesting is that, as far as it's concerned, there's no such thing as "can't." The limitations and restraints — good and bad — that govern your waking thoughts and actions recede when you're in theta. Your mind is free to imagine whatever it wants to. Free to make infinite connections and conceive of any possibility. Suddenly, you have control of an all-access pass to that vast, brilliant, untapped field of intelligence — the "unused 90%" you hear so much about. Command your theta mind to deliver a specific result, and, uninhibited by all the usual barriers to truly BIG thinking — I can't... I shouldn't... I don't know how... It would never work... It's just not possible — it will effortlessly "give up" its secret knowledge and give you everything it has. Yes, I want to crack the code of the theta brainwave state and achieve fast, effortless achievement of whatever goal I choose. The expansion of possibilities that happens in theta doesn't end with your thoughts. Studies have shown that in theta, the mind's activity can impact the structure and behavior of your physiology. Even your DNA can be made to unwind and reform in alignment with whatever thought you are forming. achieving, attracting, and creating ANYTHING you want. "Our Consultants had a record year and increased their income two to three times. We won more business than we pitched for by putting what Asara taught us into practice. " "Moments after stating The One Command®, we received a miracle. Turned down time after time for three years in our attempt to refinance our home because of bad credit due to illness, we issued The One Command® and seconds later 'clicked' on the right lender on the Internet who said YES to our dreams and made them come true! We were able to refinance our home at a low interest rate, lower our monthly payment, and immediately noticed an increase in our credit rating. We now also own two brand-new cars, all from the teachings in The One Command®. "Working with Asara from the inception of our business in imagining what was possible, clearing our limiting beliefs, and refocusing our energy into making it happen has brought us a multimillion-dollar business that we started from just an idea. We celebrate!" "According to the medical profession, I am a walking miracle. At 89 pounds with cancer, I was able to turn my cancer around by going into the powerful theta brainwave and applying it to my health. I'm a happy, healthy 155 pounds now and the doctors say I am literally a miracle. 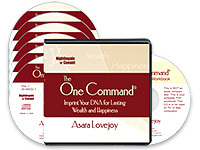 "The One Command® arrived in my email box from my good friend Asara Lovejoy during my recovery, and I used the process to stop my negative downward spiral over fears of emotional and financial recovery and change it into my positive reclamation of my life. I use it daily and continue to watch my dreams and desires come true. " "There seems to be an art in the way Asara identifies the core issue in moments after beginning your session with her. I have been coached by many of the best, and they didn't come close to what I experienced with her. She absolutely changed my world in just moments. " "Our nickname for Asara is 'The Problem Solver.' Anytime I hit the wall in my ability to go ahead with our business success, I call Asara. She is able to define, shift, and rearrange my ideas of what is possible and redirects my energy in such a positive manner I call it miraculous. You will too. The price of Asara's session is worth the investment in great returns." Command the life YOU want! Order The One Command® risk-free TODAY! The gist of all of them was same: This woman is an incredible teacher; she is teaching something that has never been taught before; her six-step process works, and it changes people's lives FAST; the rest of your customers need to know about it. In her seminar, Asara teaches a revolutionary process that enables you to do everything I've just described — shift into theta, command you mind, imprint your body, reprogram your cells — with ASTONISHING speed, ease, and control. This streamlined and extremely powerful process — it involves just six simple steps — causes complete, multilevel, and HIGHLY TARGETED transformations to take place almost instantaneously. "After attending an introduction and making The One Command® for resolution of a long-standing dispute with the IRS, I was completely surprised that within days I received the notice from the IRS saying that I would not have to pay them. The final amount they said I owed (which included a couple years of interest) was $28,450. A few days ago, I received a check to resolve the situation, and they paid me $578. A nice win!" "Asara has helped me identify and release limiting beliefs that I would never have recognized without her help. I no longer feel 'stuck' and can move forward to better manage my business and improve my relationships with family, friends, and employees. Our work has brought me a sense of peace and calm that is life changing, including the successful sale of one of my clubs. " "I issued The One Command® for $10,000, and everything started happening. I got an unexpected $5,700 bonus — an unexpected $3,800 tax return — and $450 in unexpected clients. TOTAL $10,400! Try it — it works!" "Wow, talk about power! I never could have imagined in my wildest dreams that years of feeling fear could be changed in one moment through The One Command®! That this feeling of peace was available to me, and all I had to do was Command it! This is what we should be teaching our children instead of video games!" This process, and the seminar in which Asara teaches it, is called The One Command®. And it's quickly becoming one of the most talked-about and in-demand live events in the country. People travel thousands of miles to learn The One Command® — and walk away profoundly changed and empowered with the ability to quickly create remarkable turnarounds in their finances, health, happiness, and more. It didn't take long for me to feel certain that Asara Lovejoy was the real deal. And so I approached her — initially with the hope of recording one of her live events and reproducing it as an audio program so that we could bring the incredible experience of The One Command® seminar directly to our customers. The original, complete One Command® process. Asara personally guides and instructs you through each of the six steps: ground, align, go to theta, command, expand, and receive, and she helps you to achieve total understanding and mastery of this potent, life-changing process. How to issue The One Command® correctly in order to achieve the results you want. Breathing, body posture, sentence structure, and delivery are all critical to issuing an effective command. Asara walks you through the mechanics and mind state of each individual step to ensure that you're achieving maximum benefit. The science and research behind The One Command®: How it works, why it works. The better you understand this, the more responsive your mind will be to opening and releasing its knowledge, and the more receptive your cells will be to receiving it. Order The One Command® RISK-FREE today! As always, your order is completely risk-free because your satisfaction is guaranteed. You can return The One Command® for any reason and at any time during the next 30 days. We'll issue you a full refund of the program price or an even exchange — whichever you prefer. We've experienced record-breaking demand for The One Command®. To make sure you don't have to wait, I suggest you order your copy right now by clicking on the link below. Order The One Command® today! 5. What program is running for you? 6. What are you focusing on?